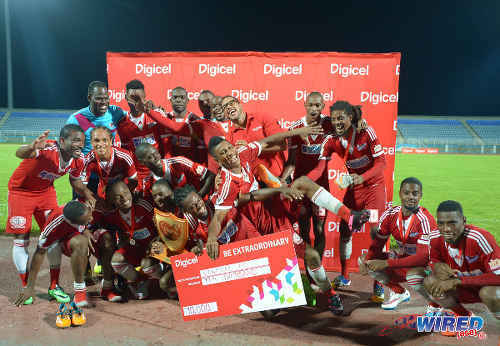 A 68th minute strike by Central FC defender Andre “Dr Dre” Ettienne was enough to settle the Digicel Charity Shield match against W Connection in Couva last evening. 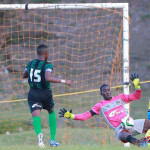 The bruising Central centre-half, formerly of Point Fortin Civic FC, took some time off from manhandling opposing attackers to arrow a powerful right-footed shot past Connection’s St Kitts and Nevis stopper Julani Archibald. Ettiene’s precise hit had a striker’s touch to it and the former Civic captain celebrated his goal by running into the stands to embrace an overjoyed spectator. Though it was dubbed a “Charity” match, the tentative and sometimes nervy approach of the two teams gave the impression of a Pro League title decider. 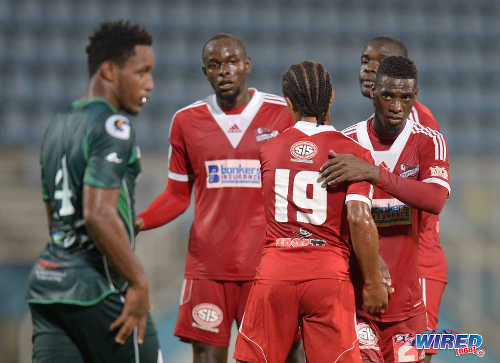 The “Savonetta Boys” and the “Couva Sharks” could be forgiven though as they have established a very intense rivalry over the past few seasons which also saw them running first and second in the TT Pro League and the Caribbean Club Championships last season. Central came out the victor in those two battles and was not quite ready to relinquish its new found dominance as assistant coach Dale Saunders cared to explain. Though both teams are currently involved in the CONCACAF Champions League, there were signs of pre-season rust early on as both started sluggishly. 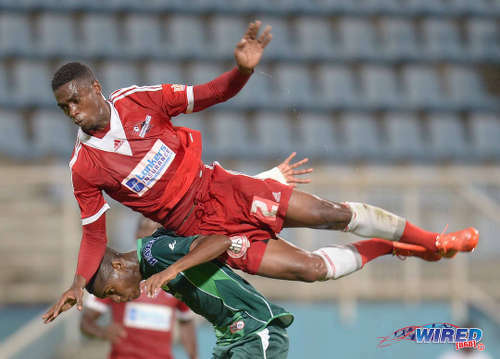 Photo: Central FC player Elton John goes flying over the head of a W Connection player during last night’s Digicel Charity Shield match. 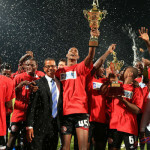 Connection assistant coach Earl Jean admitted that the Savonetta Boys were still in off-season mode, despite competing in the CONCACAF tournament. But he did not want to use that as an excuse. “We know where we are at and we are still in a pre season mode but at the same time we have been seeing silly mistakes which should not be happening at that level,” said Jean. Jean was right in his assessment too as an errant back pass by a Connection player nearly led to an opening goal for opposing striker Willis Plaza in the sixth minute. But Plaza failed to beat a sprawling Archibald in a one-on-one situation. The nippy Jomal Williams seemed to be a bit sharper at the opposite end though as he smashed a shot off the crossbar after neatly “nutmegging” Elton John outside the 18-yard area. Along with Surinamese winger Dimitrie Apai, Williams looked full of life and running in the early going and proved to be a menace to Central once more in the 25th minute as he accelerated past a couple of defenders before going down under a seemingly soft challenge in the penalty area. Referee Rodphin Harris pointed to the spot much to the dismay of the Central players. 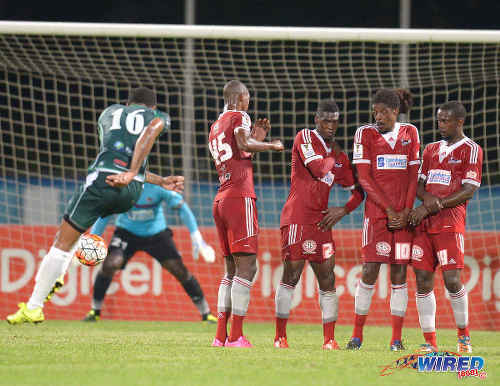 Photo: W Connection captain Alvin Jones (far left) blasts a free kick towards goal during last night’s Digicel Charity Shield affair. Looking on (from right) are Central FC players Marcus Joseph, Marvin Oliver, Elton John, Ataulla Guerra and Jan-Michael Williams. Connection captain Alvin Jones took a long and hard think before strutting up to kick his penalty. And, despite sending Shark custodian Jan-Michael Williams the wrong way, Jones blazed his shot over bar. The first half finished with a flurry of chances for both teams as Ataulla Guerra and Marcus Joseph went close for Central while Apai and his attacking partner Jhonathan Gherherdt came within inches of scoring at the other end. Apai would have cursed his lack of length for not getting on to a lovely chipped pass by Williams in the 37th minute while the Brazilian newcomer, Gherherdt, may have sworn at Central wing-back Kaydion Gabriel for clearing his goal-bound effort in the 43rd minute. The usually lethal Plaza showed more signs of rust in the 60th minute, after being played in by his new Central teammate Marcus Joseph, as he tried to round Archibald instead of shooting and another chance disappeared as he appealed in vain for a penalty. Central was passing and moving with more vigour and fluidity by then in the attacking third of the field and Saunders was quite content, particularly with talisman Marvin Oliver. 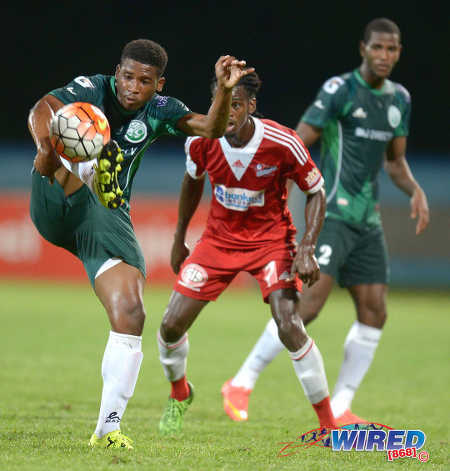 Photo: W Connection substitute Aikim Andrews (left) tries to control the ball as teammate Kurt Frederick (right) and Central FC’s Jason Marcano look on during last night’s Digicel Charity Shield match. Central’s finishing touch was still lacking though. Joseph and Plaza would usually be prime suspects to break the stalemate. But not last night. The rugged and uncompromising centre-back strode forward for a Central corner and he is an awkward opponent to contest with in the air. However, Ettienne’s feet were left unguarded as he found space on top of the box, following the set piece, and was composed enough to rifle a shot through a host of bodies and past Archibald. 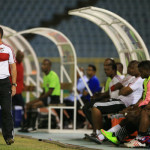 Connection boss Stuart Charles-Fevrier was far from impressed as he marched from the dugout right to the edge of the technical area and silently glared at his players like a headmaster would do to naughty students. Photo: Central FC defender Andre Ettienne (second from left) looks on as teammate Nathaniel Garcia (centre) replaces Elton John in last night’s Digicel Charity Shield. Fevrier promptly introduced the tricky Neil Benjamin Jr but it did not have the desired effect as Connection failed to unlock the Jamal Jack and Ettienne combo at the back. Instead, it was Central substitute Jason Marcano who caused the biggest stir in the dying moments. First, in the 78th minute, he wrong-footed his marker with a drop of the shoulder atop the box before firing inches wide. And then, in the 88th minute, he picked out fellow sub Nicholas Dillon with a scrumptious right-sided cross that the teenaged striker powered over the bar. 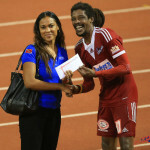 Dillon’s miss did not prove costly though as Ettienne’s goal was all the Couva Sharks needed on this Charity night. Central FC (4-1-4-1): 21.Jan-Michael Williams (GK) (captain); 15.Kaydion Gabriel, 4.Andre Ettienne, 12.Jamal Jack, 24.Kevon Villaroel; 2.Elton John, 99.Marcus Joseph (7.Jason Marcano 66), 45.Ataulla Guerra (19.Nathaniel Garcia 79), 10.Marvin Oliver, 11.Darren Mitchell (14.Nicholas Dillon 86); 33.Willis Plaza (26.Jem Gordon 89). Unused Substitutes: 30.Akel Clarke (GK), 6.Kerry Baptiste, 17.Marcelle Francois. W Connection (4-2-3-1): 18.Julani Archibald (GK); 21.Shannon Gomez, 16.Alvin Jones (captain), 4.Maurice Ford, 2.Kurt Frederick; 3.Gerard Williams, 8.Briel Thomas (23.Kevon Goddard 57); 12.Dimitrie Apai (17.Aikim Andrews 57), 48.Stiven Lopez Concha (34.Jabari Mitchell 46), 10.Jomal Williams; 27.Jhonathan Gherherdt (11.Neil Benjamin Jr 69). Unused Substitutes: 1.Terrence Lewis (GK), 5.Triston Hodge, 13.Kion Joseph, 35.Keston Julien, 46.Anfernee Frederick. 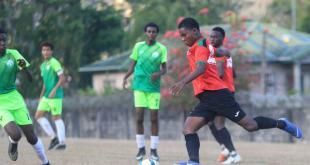 Central FC 1 (Andre Ettienne 68), W Connection 0, Ato Boldon Stadium. I think he was injured after the first LA Galaxy game Vla. I will double check. But he is there for sure. Where did Sean Desilva go? Did not see his name on the sheet is he no longer with Central? Wow. He sure would. That would be an impressive signing. At least in terms of his potential. Dwight Quintero will make a difference to W Connection.